For their first Beausoleil experience, these 4 anglers catch some nice carp to 36lbs and cats to 96lbs. This week we had the pleasure of welcoming another new group to the venue. 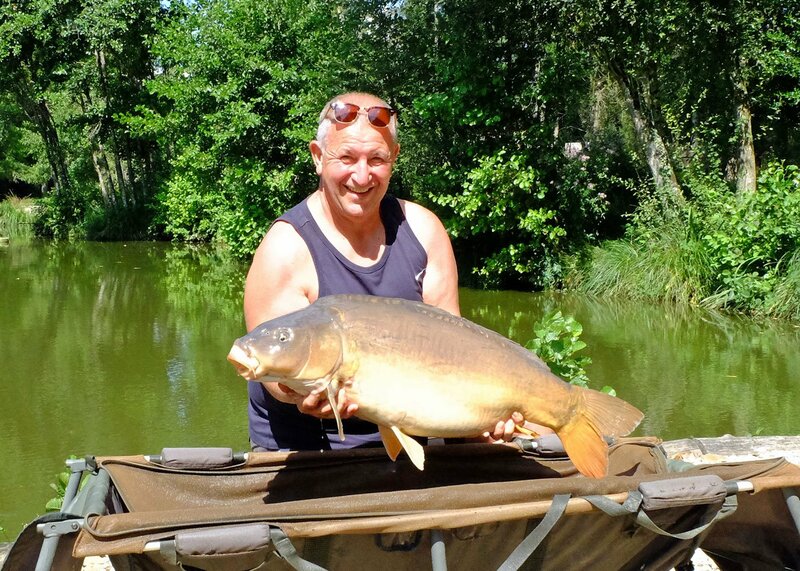 Dad Peter, along with his two sons Dan and Joe, and friend Jeff are all keen carpers and had been dreaming about fishing Beausoleil for a very long time. 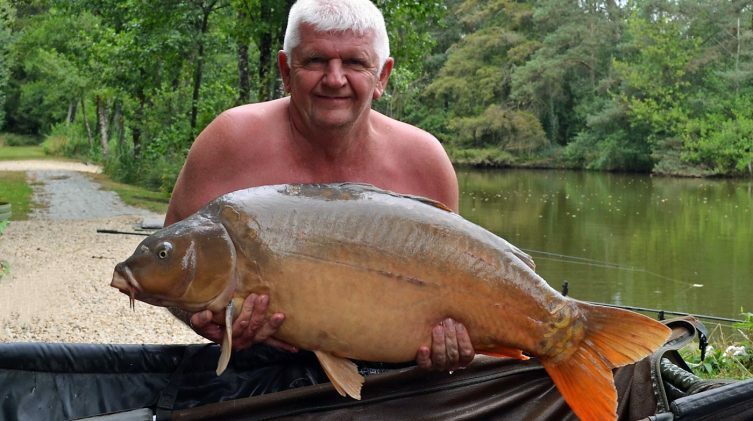 Everyone apart from Jeff had fished in France many times before but they’d mainly fished one lake that they knew well. They loved the place on arrival and as usual we spooked some big lumps mooching round the margins on the walk round. Jeff’s main target was the cats and he couldn’t resist starting off in Catfish corner. After finding some nice open water hard spots, he dropped large “cat traps” of pellets and boilies on the spots with the dedicated catfish bottom bait rigs mounted with 2 x 24mm boilies on one and 2 x halibut pellets on the other. 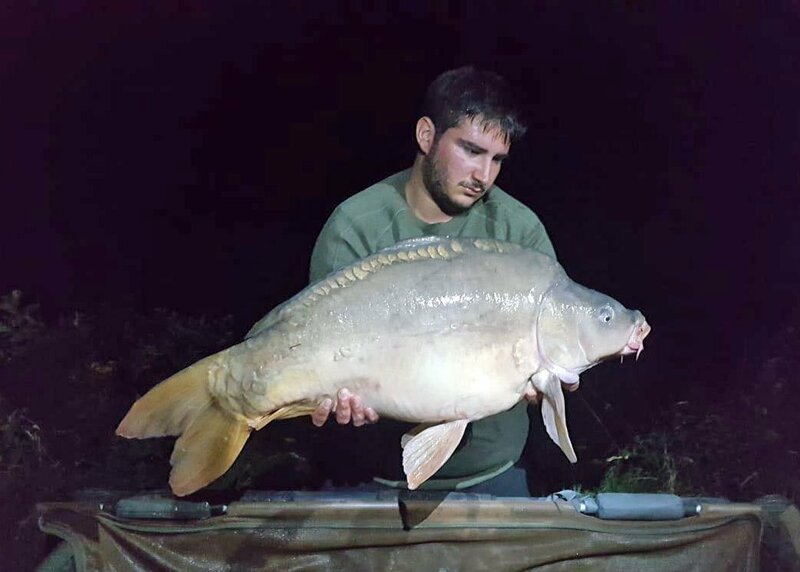 First night he banked what he’d come for in the shape of a 96lbs monster… nice work mate! The next night he was in again. This one was a little smaller at 91lbs, that’s Beausoleil baby! 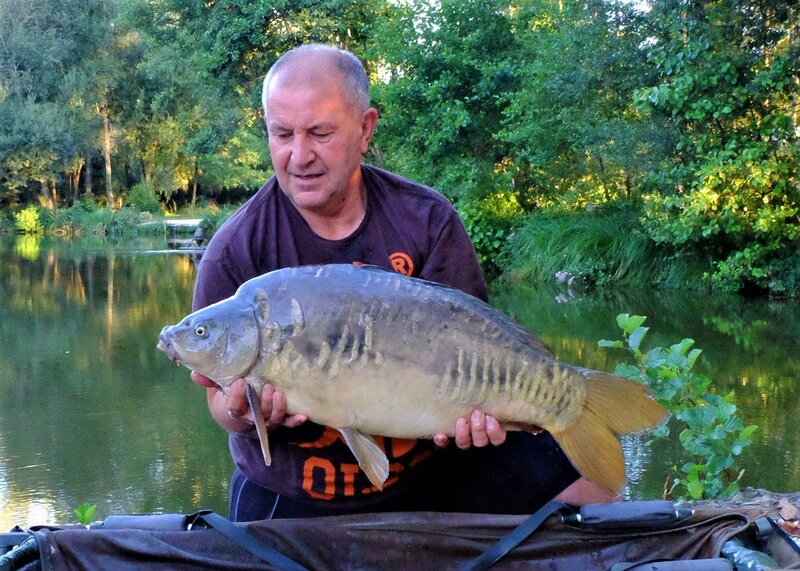 Jeff had gone for 40lb Big Game with the Kryston Kraken hooklink of 85lbs. 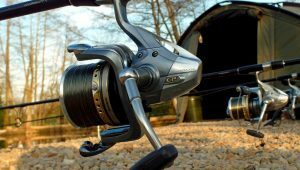 Rod wise it was heavy duty 6lb TC Daiwa mission with heavy duty sea reels. 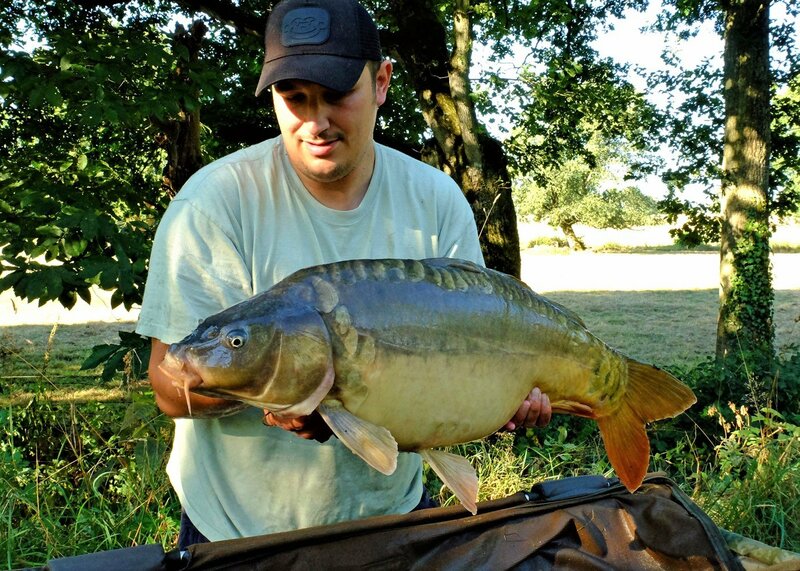 Proper gear for big fish… Nice! After Dan and Joe opened their score sheet on Monday with a fish each, Dad Peter joined them on Tuesday but that was if for the next 24hrs. Needless to say there was a bit of head scratching on Wednesday as the promising start had stopped. My first job was to test oxygen levels which have been consistently good of late. With a morning low of 63% (good), I knew that they would still be having it big style and that there had to be another explanation. Rig clinic ends in a quick bite! 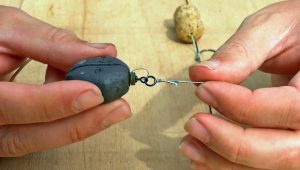 Many people believe that there is some great mystery to carp fishing and that when you’re not catching there is nothing that you can do to affect the situation. What I see week in week out is that, as long as the oxygen is good, carp are always eating as much food as they can possibly process. Peter and I took a look at what the guys were fishing with and I saw some familiar sights: a variety of rigs issues and blunt hooks. 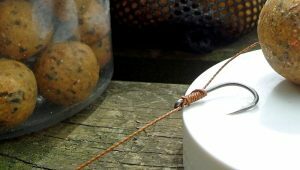 I knocked up a simple single 24mm bottom bait rig, grabbed a new hook from the packet and gave it a few licks of the hone to give it a killer edge. We clipped it on one of his rods and I rowed it out and stuck it on a known marginal spot. I’d seen a carp bosh just a few meters away while I was tying the rig and Peter was up for nicking a quick bite. An hour later Peter was in! The fish battled really hard for over 10 minutes and everyone was relieved when it went in cleanly over the waiting net cord. Skills mate! The next morning, things were looking up as Peter had had two more upper twenties and Dan and Joe had added another one a piece. 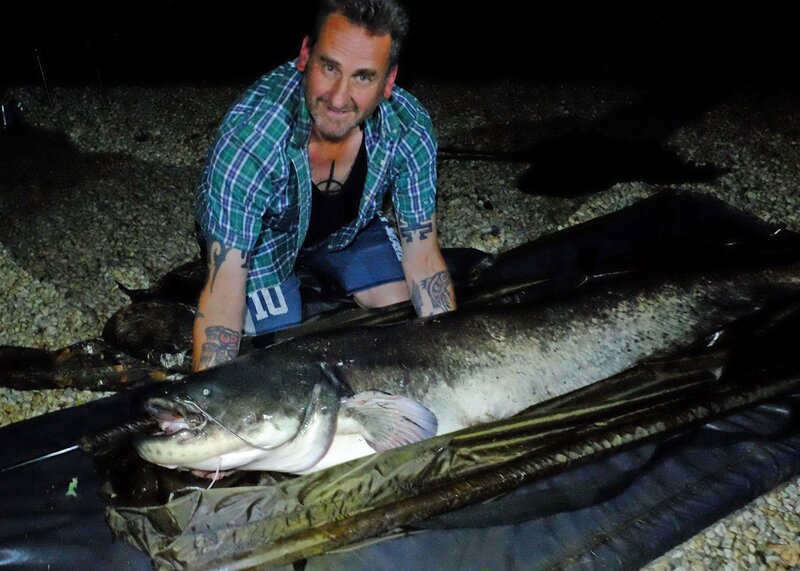 It seemed like it was a carpy night as there was no action for Jeff from the cats. 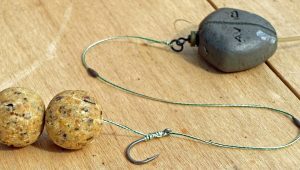 Simple, well tied rigs, uber sharp hooks and plenty of boilies and pellets all coming together! Point ‘A’ never gets much of a mention in the catch reports. There is always plenty of fish activity in this area of the lake but it’s one of the hardest swims to fish well. It’s shallow with a complex mixture of rocky bars and it’s peppered with small (<1m) holes that have been excavated by the fish from the soft silt. Precision here is key. Finding these spots takes time and trouble and fishing them well is an extra effort. It does tend to fish better with a NE wind pushing into the island margin but the top rod spot very rarely comes from the angler fishing here. Our half linear continues to grow nicely! Peter had already had 4 fish and was in the lead by Wednesday. He’d seen a lot of activity over one particular small spot and a quick explore with the prodding pole told him all he needed to know. It was hard as nails where the fish had literally polished every stone! Simple bait boat traps with loads of pellets and boilies were dispatched to the spot with pin point accuracy and a single Beausoleil 24mm bottom rig was dropped along with the freebies. The result? 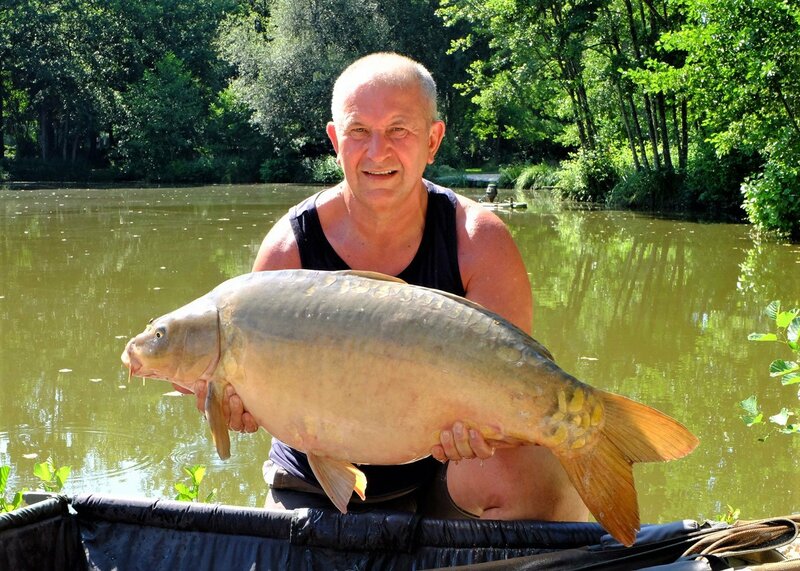 Seven more carp in 2 days from that margin! In fact when we called in to do a quick oxygen check on Friday, he was into his third of the morning, the very rare Single Scale at 36lbs (uncaught for 18 months). Lovely work mate and thanks for finding another brand new spot! I know I bang on about how important it is to hand sharpen hooks all the time but the results speak for themselves here. Some companies sell readymade hand sharpened hooks for those that don’t have the time to practice the skill. This week I saw some examples from one of them. This is the second manufacturer of hand sharpened hooks I’ve seen and I was very disappointed again. Under a professional loupe, I could see that they’d taken way too much metal away from the behind the point. They’d only removed metal from one face and then not even gone anywhere near the point. The result? A blunt, weak hook that will fold over when faced with a hard mouthed carp such as we have here. There may be good readymade sharpened hooks out there but I’d be careful before spending money on them. Your options for Beausoleil when it comes to hooks and rigs is to change hooks each time you recast if your current one is damaged or if you buy our Beausoleil rigs, I’ll be happy to give them a touch up when we meet. All good. Follow Matt’s advice. Boilies and pellets. Sharpen your hooks!! !